While oak trees (Quercus spp.) vary in appearance, size and climate preference, depending on the species, they all produce acorns, inconspicuous flowers and develop from a single root system. The slow-growing trees grow in most regions of the U.S., from coastal southeastern states to the Pacific Northwest. Oak trees develop deep tap roots. 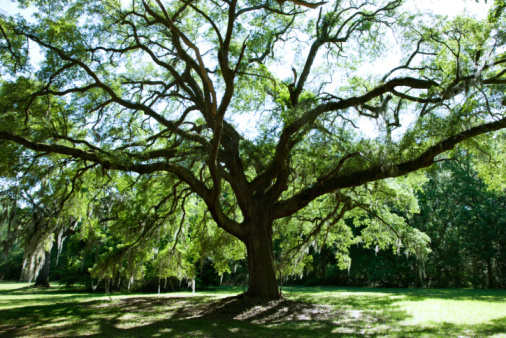 An oak with a healthy root system can develop into majestic, round-crowned shade tree. Young seedling oak trees have tap roots. Unlike the fibrous roots that grow in shallow soil around the base of a plant, tap roots grow deep into the soil and originate directly beneath the tree's trunk. 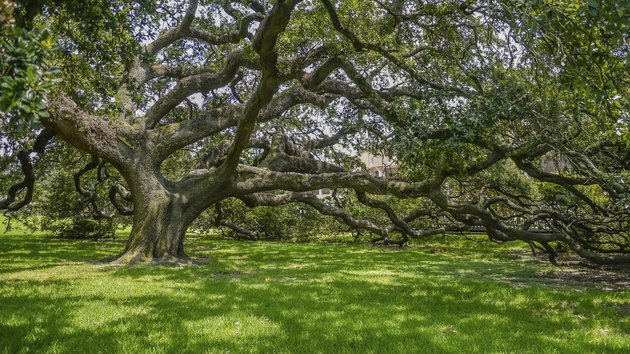 Oak tree root systems develop best in slightly acidic, well-draining soil with ample oxygen and no obstacles such as other large trees, underground pipes and buildings. Do not plant oak trees in places where roots are likely to interfere with sewage system pipes or your home's foundation. Some oak tree roots can easily adapt to drought conditions, such as native California oaks that can withstand long, dry summers. These include the California white oak (Quercus lobata) which grows in U.S. Department of Agriculture plant hardiness zones 7 through 11 and the blue oak (Quercus douglasii) which grows in USDA zones 5 through 10. Oak tree roots have a symbiotic relationship with a type of soil fungi, called mycorrhiza, which live in most soils. Of the two types, oak tree roots depend on ectomycorrhizae mycorrhiza for survival, as it forms a physical sheath around the root and protects it from fungi causing disease. These fungi share the nutrients they collect with the roots. Mycorrhiza may also increase the tree's drought-resistance, help seedling growth, increase resistance to diseases or help transplanted roots survive. Damage to the soil can disrupt the mycorrhiza and affect the health of oak trees. Since the majority of mycorrhiza resides in the top few inches of soil, tilling the soil deeply and frequently exposes the fungi to the sun's damaging rays. Other practices that damage mycorrhiza include using heavy applications of phosphorus, growing only one species of plant in a location, slow-burning fire and water-logged soil. In addition to watering an oak in times of drought, it's important to avoid injuring the roots when you work around the tree, especially if you're digging or using power tools. Mowing and digging out weeds can injure an oak's roots and break the bonds mycorrhiza have to the roots. Exposed and damaged roots are more vulnerable to diseases and pests. In addition, disturbed soil encourages weeds to grow, and the weeds can rob the soil of its nutrients. Using insecticides and fungicides in your yard can also damage mycorrhiza. Soil compaction can reduce the health and vigor of an oak tree and its root system. People constantly walking near the tree or driving or parking over the root zone can cause the soil to become compressed and dense and lacking the necessary air pockets. Compacted soil drains poorly and doesn't allow enough air to reach the roots, compromising the oak tree's health. Introduce earthworms and compost to help to alleviate compaction. You can start a healthy oak tree with a strong root system from a mature, plump acorn that you collect yourself and keep moist with organic material. If you want to transplant oaks, it is best to do it when the tree is less than 3 years old as older oaks do not transplant well because of their tap roots. For trees less than 2 years old, the root crown should be above the soil when you transplant the oak.